With quite a few stocks that I owned had fallen in value enough that I thought it was worth jumping in and buying some more shares to lower my average cost down. There were also a couple of stocks/ETF’s that I had on wish list that had become a lot cheaper and thought it would be good to start building a position. Stock fell to $53, so bought a little more to take my average cost down from $61 to $58. The results out of there Macau properties continues to be good, so I thought it would be a good time to buy some more while others threw it out. On one day during October the stock dropped more than 7 percent. The only thing I could find out was that the latest release of the Black Ops franchise was out and it had an outstanding opening weekend (funny how video games have opening weekend like movies). It did over $500 million in sales….in a weekend! How many movies can do that? 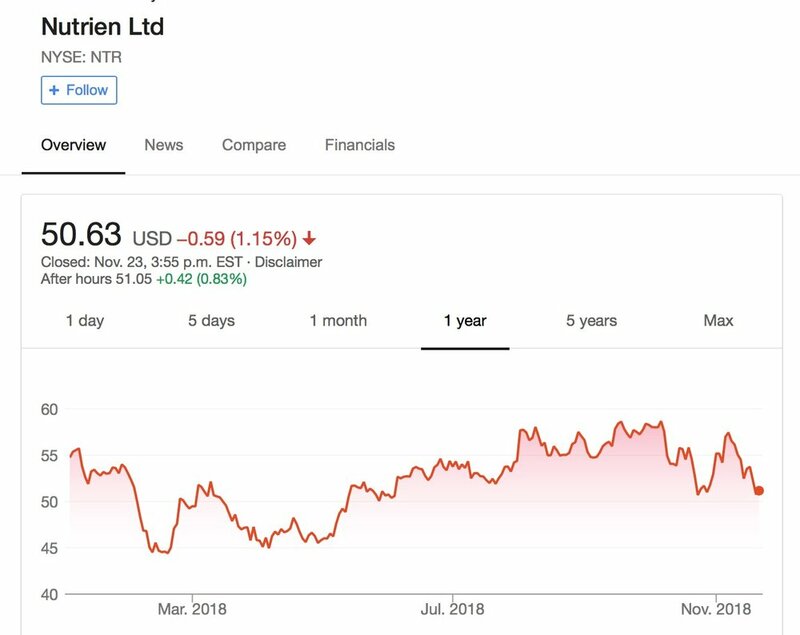 Yet somehow the stock dropped? Some say it is because China is putting restrictions on video game content. If you’re doing $500 million in sales, does that even matter? The stock fell below my cost base of $75 and on October 23rdstock fell below $70 to $67 so I decided to buy some more shares on a couple of occasions during the month to lower my cost base down to $72. With the pullback I was basically break-even on the stock and with the pullback I thought it would be a good opportunity to add more shares. Been doing well with the stock and I have a pretty solid position in a couple of accounts, so initially I wasn’t too keen adding more. It’s had a pull back on very limited news and what news has actually been quite good as the potash prices appears to be perking up. The last few contracts with India and China, the major purchasers have been for higher prices, so long-term I think is still good the agriculture company. The purchase took my cost base up to $66. Sure enough, the company reports some good earnings and the stock popped back to near $75 so managed to get a few more extra dollars in my pocket. The company reported uninspiring numbers and that took the stock down about 5 percent. Uninspiring is in fact the norm with Winpak. It’s a boring old packaging company that day-in-day-out manages to create consistent tangible wealth. The balance sheet continues to be rock solid. 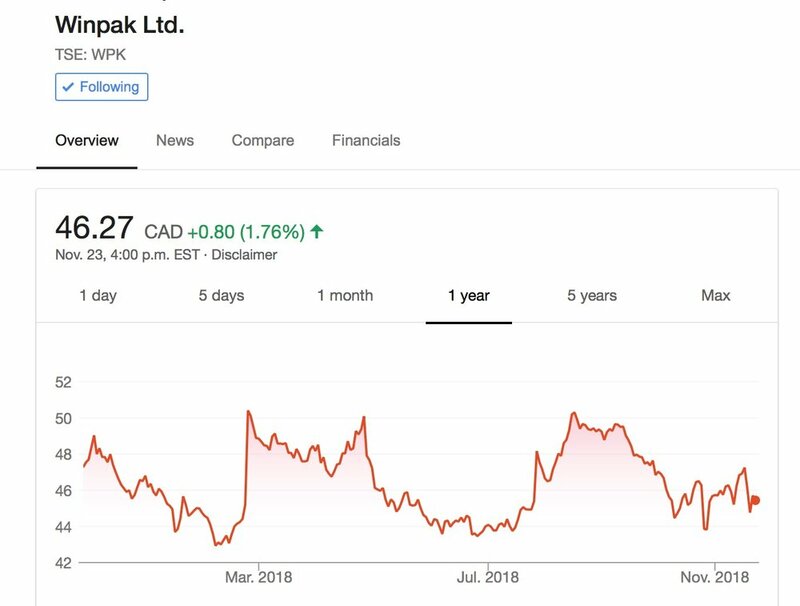 So when the stock fell like a stone (for Winpak), I thought it would be a good time to add shares to lower my cost base. Which is now at $46. The stock may come under more pressure if the economy slows down and there is less demand for packaging material. From my experience even in down cycles, the company still manages to generate decent profits, which I’m always looking for in companies to invest. 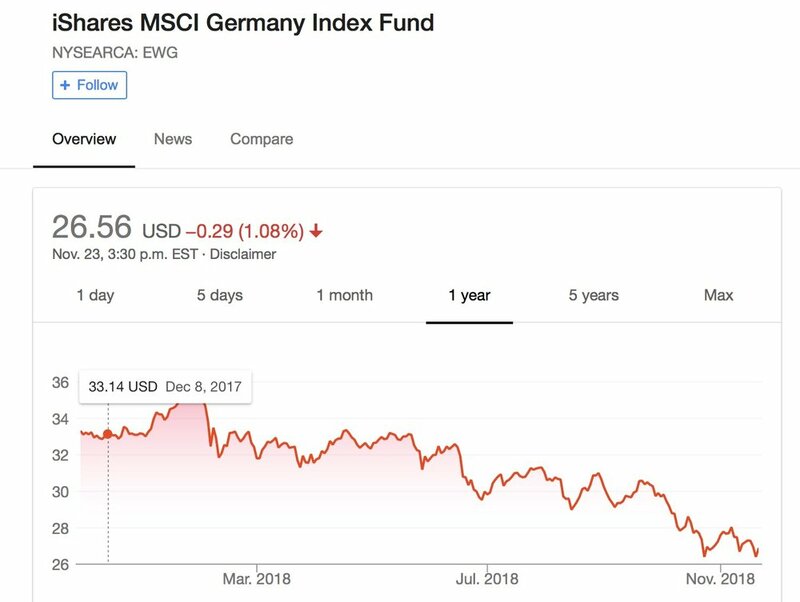 The German stock market has been one of the worst performing sectors in 2018, so I decided to take a look. Given that Germany is a major economic player, the opportunity to buy into the German market at a 15 percent discount sounded appealing. I put together a mind-map video where I walk through the process of evaluating and selecting and ETF that invests in German stocks. Stock was down over 30 percent over last 3 months, despite pulling solid revenue. 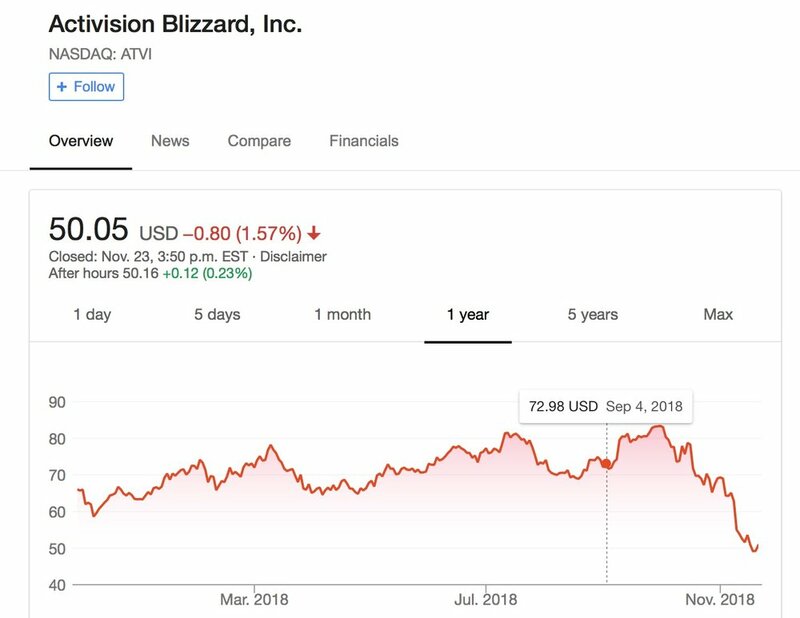 I think it is better than Activision, but I thought the stock was too expensive at the $130 level when I first took a look at it. With the stock trading at just under $100, I felt more better to open a position at this level and slowly build it up. The next few days it fell even further to $89 and I was ready to buy more shares, but it popped back over $92. It’s going to be a bumpy ride holding this stock I have a feeling so I have to be ready for it and patient enough to jump in when it gets under pressure. So a very busy month indeed, but despite the roller coaster ride of the markets, I felt I was able to stay focussed on my decision-making and execute my investing playbook. We’re half-way through the year and so I thought it would be a good time to check back into my ROBO portfolio to see how it’s doing and if there is anything interesting going on. Three and half years ago I decided to try an experiment and find out for myself. I setup an account with one of the big Robo Adviser firms and invested $5000 of my own money into it. My goal was to go through the process and blog about my experience and more importantly, the results. I said that we need a good five years to really get a handle on how effective these services are compared to traditional wealth management services. Well, we're coming upon the 4th anniversary of my ROBO account, so let’s take a look at how it’s doing at the mid-year mark. This is the third and last in a series of episodes where I walk through my investment decisions I made in March. In this post, I share my thought process that lead me to buy shares in Southwest Airlines. This is a bit of a rant post. Another annual Real Estate Wealth Expo has made its way through my home town. This year some serious star power was on display. Baseball players, Pop Musicians, and Dragons were regaling attendees and their slightly open wallets with tales of how to escape the rat race and live the 6-49 lifestyle. People leaving these events usually seem to feel they are on their way to financial independence or at the very least got a good cardio workout. Unfortunately the whole thing is a scam. My rant is not about the concept as Real Estate Expos like this are just the latest iteration of get-rich-schemes that prey upon the gullible. What got me concerned was the response by people, especially on social media. In Part 1, I shared my investment decisions to buy more shares in stocks I already owned as well as my decision to sell a portion of my short position on the S&P 500 index. During February I also took advantage of the pullback in share prices to add a few new stocks to my portfolio as I felt they had now become attractively priced. I will share my evaluations for each stock, all of which involve answering the 8 questions, I ask each time I am analyzing a stock. My first new stock that I added was Walmart. Three years ago I decided to try an experiment. I setup an account with one of the big Robo Adviser firms and invested $5000 of my own money into it. My goal was to go through the process and blog about my experience and more importantly, try to find if using this type of service can generate better returns than if I did it myself or used a traditional adviser. I said that we need a good five years to really get a handle on how effective these services are compared to traditional wealth management services. Well, we’ve now crossed the 3-year anniversary of my ROBO account, so let’s take a look at how it’s doing now. One of the values I feel strongly about as an investment coach is that I practice what I teach…and be transparent about it…good AND bad. It’s one thing for me to coach people how to make better decisions and develop and teach courses on how to buy and sell stocks and ETF’s. It’s another thing to model the behaviour. Throughout the year I’ve shared and tweeted (#trade2017) with you the investment decisions I’ve made throughout the year. Well it’s that time of the year where we set scroll down the page and see what I what I did right and more importantly what I did wrong…and did I gain any insights that will help me become a better investor? As we begin a new year, we get blitzed by Wall Street and Bay Street money "experts" and soothsayers with variety of predictions and forecasts of where stock markets, economies, and interest rates will be heading. Then...nothing. No follow-up to see if these people actually have the chops to predict the future. I always like to roll back the tape to see how those predictions panned out. November brought more daily records for the stock markets around the world. The Dow Jones Industrials has not posted record closes over 60 times this year. There still hasn’t been a 1 percent change in daily stock prices this year and every month has posted a positive return this year. Everything is awesome, but when I see these extreme levels of optimism, I start going through my portfolios and see if it may be time to bank some profits off this euphoria. I was faced with several crossroads type decisions with some of the stocks I owned. Should I sell or should I continue to hold on and squeeze more profit? Here's is my list of my decisions I made along with rationale. October was pretty active month for investment decisions. As the market continues to surge, I ended up taking a fair bit of investment decisions. Because of this I had to break up this post into several smaller posts. In Part 1, I share my thought process I was going through with several investment decisions involving controlling losses. In the next couple of posts I share my thought process that went into my decisions to add a couple of new stocks to my portfolio. For those who have followed my blog and have taken my investing courses, every stock I analyze I try to answer the following eight questions that usually gives me a pretty good idea if I want to buy or avoid a stock. As we cross the mid-pole mark in 2017, it seems like a good time to check in on my Robo Portfolio that I created two and half years ago. For those jumping on for the first time, I wanted to try to find out if this new type of investment service which was taking the industry by storm a few years ago does any better job of creating wealth for investors compared to the traditional methods of investing (i.e. Do-It-Yourself or having a professional manage your money on your behalf). I made a couple of investment decisions in April, one building upon previous posts where I’m trying to figure out where to put money in the Mad King world we live in right now. The other decision was a sell decision that was a bit of surprise. From time to time something happens to my investment decisions. Two years ago I decided to setup an account with an online wealth management company that manages portfolios using algorithms and computer code. Over those two years I have blogged about my experience using a robo adviser and more importantly the results. Here is my update as we cross the two year mark. I wasn't really planning to make too many moves in December but the market thanks to Donald Trump's animal spirits was in a rather euphoric mood. I suddenly found some of the stocks and ETF's I owned were generating very solid returns and I had to make a decision to keep riding the wave (is the wave sustainable?) or bank some profits. It turns out I did a little of both. Throughout the year I’ve shared and tweeted (#trades2016) with you the investment decisions I’ve made throughout the year. Well let’s take a look and see what I did right and more importantly what I did wrong…and did I learn anything from it? 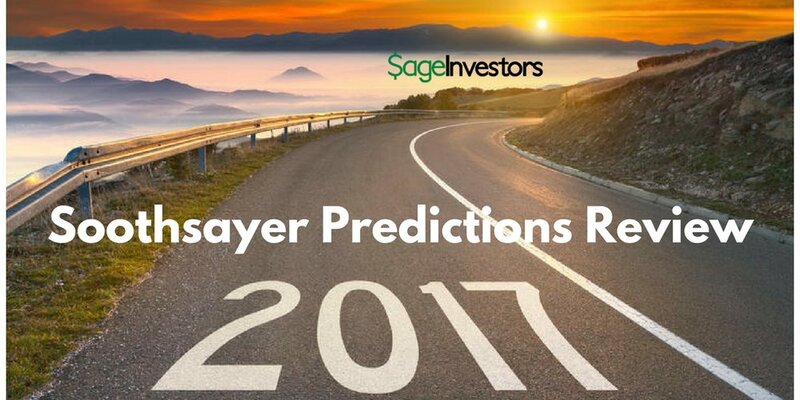 What's New for 2017 at Sage Investors? As we embark on a new year, I thought I’d close the doors on 2016 and reflect on a very eventful year for myself and my practice and share some initiatives we're planning for 2017.